The unimaginable has happened. 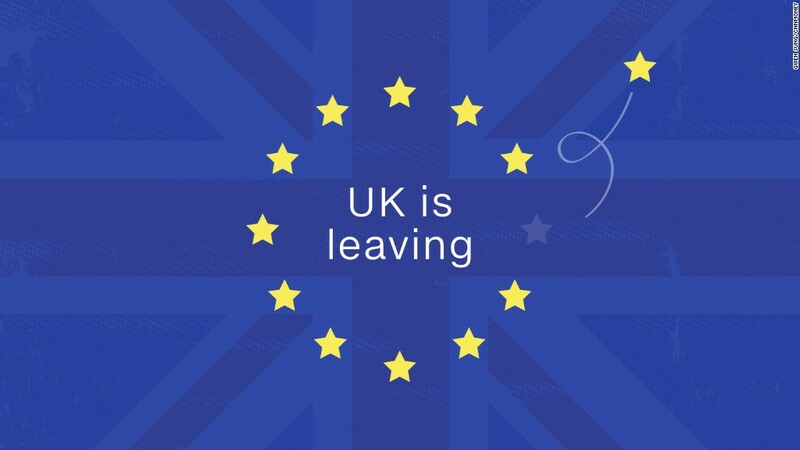 The U.K. has voted to leave the European Union ... and investors around the world are in full-fledged panic mode. Could this be the beginning of the end for the EU? And even the start of another financial crisis like 2008? Stocks are plunging in Britain, Europe, Asia and on Wall Street. Big banks like JPMorgan Chase (JPM) and Goldman Sachs (GS) in the U.S. as well as Royal Bank of Scotland (RBS), Barclays (BCS), Credit Suisse (CS) and Deutsche Bank (DB) were all crushed. The British pound sank like a stone. Gold prices surged, another sign of investor unease. Gold often does well in times of economic and market turmoil. The VIX (VIX), a volatility measure that is dubbed Wall Street's fear gauge, soared more than 40% Friday morning as well. CNNMoney's Fear & Greed Index, which looks at the VIX and six other measures of sentiment, slipped into Fear mode Friday. It was showing signs of Extreme Greed on Thursday as traders bet that the Remain vote would prevail. Even the U.S. Federal Reserve sought to calm frayed nerves by saying it "is prepared to provide dollar liquidity" to other global central banks "to address pressures in global funding markets." So just how bad could it get? Is it really 2008 all over again? Or something more benign like Wall Street's Black Monday in 1987, which ultimately turned out to be a blip in the middle of an 18-year long bull market? Vote here in my Twitter poll. Brexit is happening. (Sorry, @lindsaylohan!) Is this the start of another 2008 for the global financial markets? Several market experts are urging investors to take a deep breath though -- the market equivalent of the famous "Keep Calm and Carry On" World War II era saying in Britain. "This may be more of a political crisis than a financial crisis. That makes this different from Lehman Brothers going under in 2008," said Chris Gaffney, president of EverBank World Markets. "It does not look like this is a liquidity crisis. But it's a big deal." The fact that 2008 wasn't that long ago is also, somewhat perversely, a good sign. Central banks have seen this rodeo before. Douglas Coté, chief market strategist with Voya Investment Management, said the European Central Bank, Federal Reserve and other central banks are used to managing in a crisis. He added that the Brexit vote is more like the downgrade of the credit rating of the U.S. in 2011. It was unprecedented and led to some short-term market volatility. But investors quickly got over it and pushed stocks back to record highs. "Stick with your investment plan. Corrections happen. Don't make rash moves," Coté said. Zhiwei Ren, managing director and portfolio manager at Penn Mutual Asset Management, said the Fed probably won't raise interest rates for the rest of the year as a result of this. "The market was not prepared for this at all," he said. "This is terrible for banks. They are going to remain a value trap for a while. It's going to remain a very bad environment for them." The Brexit vote could even lead to a slow unraveling of the European Union as we know it. Other EU nations may now start to wonder if the monetary union experiment has failed. "This could be the beginning of the end of the United States of Europe," said Jim Keegan, a bond fund manager at RidgeWorth Investments.